This little guy, like most, adored all of the time spent outside during the spring, summer, and fall months. While I should have been more aware of the shift on the horizon, it honestly never dawned on me just how much the changing seasons can upset a toddlers routine. 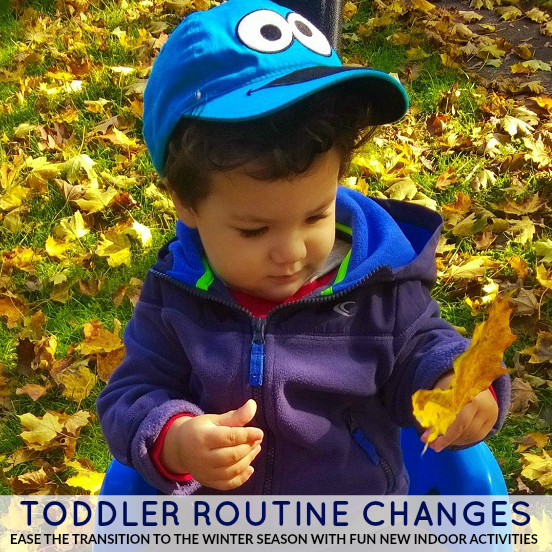 Toddlers love the comfort and predictability of a routine, and all of the change that the winter season ushers in, can be a difficult adjustment. First, the time change wreaked havoc. He was used to swinging in the backyard before dinner, but by the time dinner time rolls around now, it's dark. There were many tears shed over this particular change in routine. And there were even a few nights when I caved and gave him a few minutes on the swing in the dark; with the flood lights on of course. He's gradually adjusting to his new routine, and we're mixing it up with some fun new activities that will hopefully help ease the transition. We added a few indoor toys to help burn off some energy. 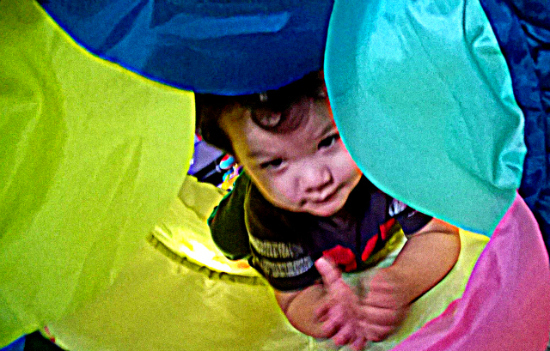 He loves crawling through his tunnels, and the toddler trampoline (with handlebar for stability) is quickly becoming a favorite for him. He's also having a ton of fun creating and getting messy with paint! 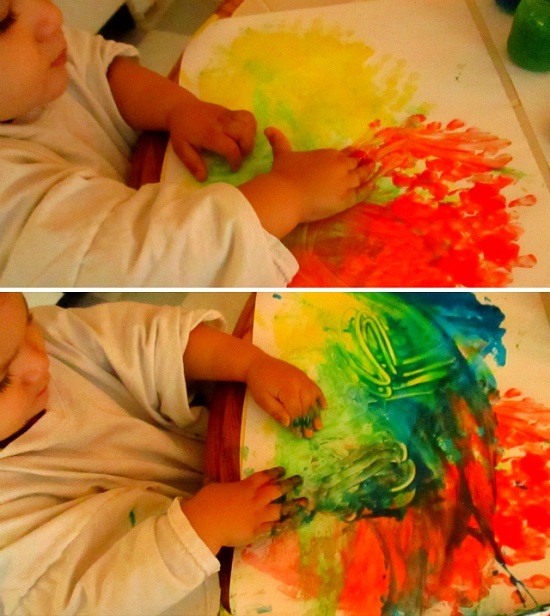 Finger painting is always a winning idea these days. You can check out our DIY edible toddler paint recipe HERE. It's perfect for little one's who love to taste test everything; and what toddler doesn't, right? We're also easing the transition by keeping parts of our routine the same. Our snack times, and meal times remain steadfast benchmarks for him, and we make sure to keep plenty of his favorites on hand. 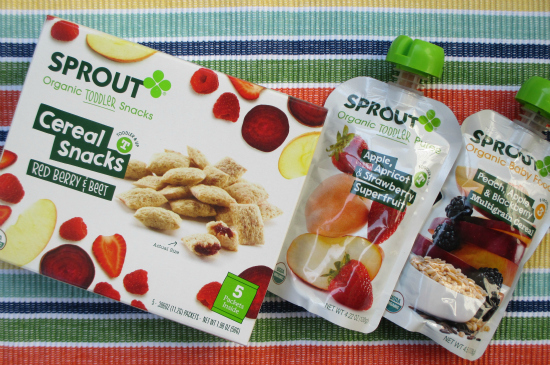 Whether we're at home, or on-the-go Sprout Organic ® offers up nutritious and delicious options perfect for little ones who are learning to self-feed. 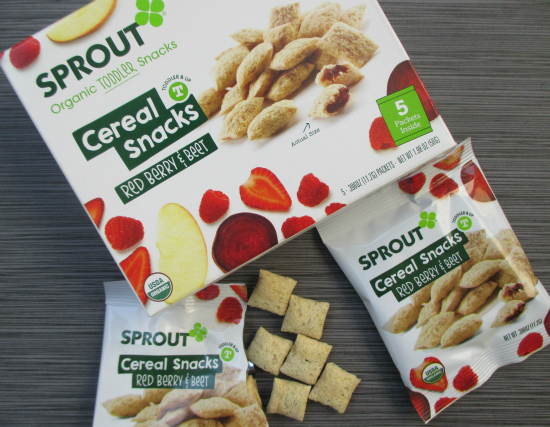 Our little guy is always game for their cereals Red Berry & Beet Cereal Snacks, and their Sprout Organic ®Toddler Puree Pouches are the perfect treat / on-the-go meal option when we're out and about. Now, I can't wait for some snow! I'm sure sledding will help him appreciate winter a bit more. How do you help your toddler adjust to the changing seasons? Do you do any special activities with them during the winter months? Share in a comment below! This is a sponsored conversation written by me on behalf of Sprout® Organic Baby Foods. The opinions and text are all mine.